After a lengthy hiatus, I thought it would be appropriate to revive Films From Beyond for the Halloween season. Leading up to All Hallow’s Eve, I will post on some of my favorite horror films to stream or pop into the DVD player on these cold October nights. See also the FFB Facebook page and Twitter feed for additional content. Pros: Great cinematography by Edward Scaife establishes an eerie night world; Niall MacGinnis plays the part of an urbane warlock with understated perfection. 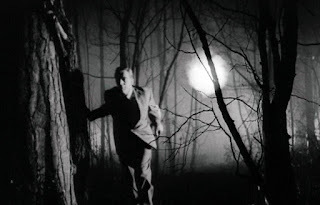 Cons: Shots of the monster-demon inserted at the producer's insistence spoil director Jacques Tourneur’s carefully crafted atmosphere of unseen menace. A good horror film, like a Trump tweet, subverts our sense of what’s normal, turns everyday things upside down, and takes us well out of our comfort zones. Night predominates, people and objects take on sinister aspects, and paranoia breeds in the shadows. Science and reason retreat against the powerful forces of darkness. Scientists and intellectuals have never been treated particularly well in popular culture, but the horror genre in particular specializes in laying them low. At worst, they’re done in by their own hubris or madness. At best, they hang on by a thread, stubbornly unable to apprehend the unnatural forces that beset them. The protagonist in Night of the Demon, psychologist John Holden (played by stolid American actor Dana Andrews) is a veritable poster boy for the hapless horror movie egghead. For all his education and knowledge, he is particularly ill-equipped for his encounters with the dark side. He keeps trying to apply reason to things that are aggressively unreasonable. In the end, he will have to learn a whole new set of rules in order to survive. Dr. Holden has traveled to London to attend an international conference on paranormal psychology. Upon arriving, he’s distressed to learn that a colleague, Prof. Harrington (Maurice Denham), has died in a horrible accident, his body mangled beyond recognition. Harrington had been set to expose Julian Karswell (Niall MacGinnis), the notorious leader of a local devil-worshipping cult, at the conference. At Harrington’s funeral, Holden runs into a young woman who had ridden over on the plane with him, and learns that she is Joanna Harrington (Peggy Cummins), the professor’s niece. Joanna shares her uncle’s diary with Holden, which chronicles Prof. Harrington’s growing dread as he realizes that Karswell has cursed him, and that the cult leader’s powers seem to be very real. Holden is troubled that Joanna and several of his academic colleagues seem to think that there is something to this supernatural business. After he discovers that Karswell has secretly passed a piece of parchment with strange writing onto him, his skepticism wavers as disturbing things start happening. The parchment seems to have a mind of its own, tearing itself out of his hands in a gust of wind to throw itself on the fireplace (the fireplace screen prevents it from being incinerated). "It's just an old piece of paper with odd writing on it. How important could it be?" After a surreptitious night time visit to Karswell’s estate in search of an occult book that might shed light on the mystery, Holden is pursued through the darkened woods by an uncanny, luminous cloud seemingly bent on his destruction. Holden finally appreciates the gravity of his situation when he hypnotizes a former Karswell cult member, Rand Hobart (Brian Wilde), bringing him out of his catatonic state (interestingly, he does this before an audience of fellow psychologists). The terror-stricken man reveals that he had been marked for death by his own brother who passed him the parchment, but he had managed to pass it back -- and condemn the man to a horrible death. After finishing his bizarre tale, Hobart leaps up, runs madly about, and then kills himself by crashing through a window. A thoroughly humbled Holden now knows what he has to do -- but can he pull it off? On the basis of the final product, which has gained a reputation as a minor classic over the years, the choice of no-nonsense, all-American actor Dana Andrews as Dr. Holden was a good one. His sheer American-ness further establishes Holden as a stranger in a strange land, one that seems eternally shrouded in gloom and night, and where the supernatural is very much at home. However, according to some members of the production crew, Andrews was almost as difficult to work with as Karswell’s demon. Over a decade earlier, Andrews’ career peaked with appearances in such hugely popular films as Laura (1944) and The Best Years of Our Lives (1946; winner of 7 Oscars including Best Picture). By the mid-fifties, Andrews was struggling with alcoholism, and the A picture offers had dried up. 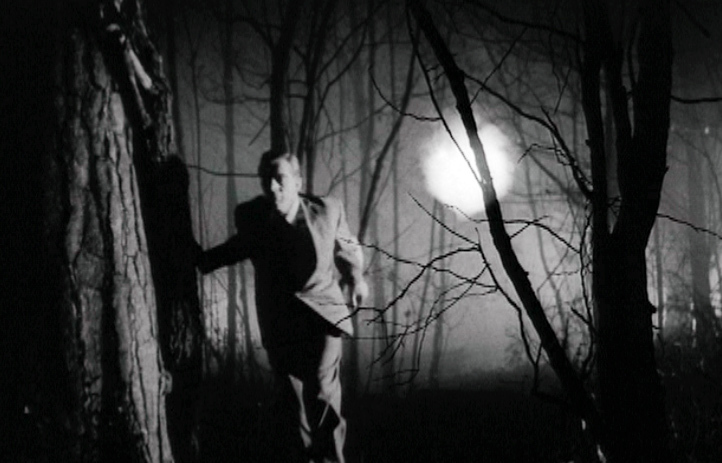 was part of Tourneur's original vision. Chester’s insistence that an actual monster be shown in the film has been written about many times, and is a classic example of the pragmatic, money-minded executive clashing with the cultured filmmaker wishing to protect his/her artistic vision. Without the participation of the director, Jacques Tourneur, Chester had additional shots of a puppet demon done and inserted them into the beginning and end of the film, presumably to effect a more eye-catching marketing campaign and goose ticket sales. The film’s saving grace turns out to be the character of the crafty and cultivated devil cult leader Julian Karswell, played by Niall MacGinnis. MacGinnis’ Karswell is the perfect complement to Andrew’s down-to-earth American skeptic. He is calm, measured and sophisticated -- and very much a believer. In a lesser film, such a character might be played with arched eyebrows and sinister scowls. Karswell, on the other hand, is self-contained and scrupulously polite. He even seems a bit delicate and nerdish, living with his somewhat befuddled mother on a palatial country estate. But just beneath the surface is simmering menace. At the beginning of the film, Harrington, panicked by what he has seen, begs Karswell to call off the entity that has been sicced on him. Karswell asks the professor if he still has the parchment. When Harrington responds that it was destroyed, Karswell calmly tells him that he will “do everything I can,” -- which is exactly nothing -- and sends the man back out into the night to his doom. Karswell demonstrates his devilish playfulness yet again when Holden and Joanna visit him at his estate. They find him in clown makeup hosting a lavish Halloween party for the local children, playing the part of magnanimous country squire to the hilt. When Joanna goes off to help Karswell’s mother with the festivities and Karswell has Holden alone, he drops his pretense. Determined to put the fear of the Devil in Holden, Karswell holds his head in his hands momentarily and then announces simply, “it’s done.” A furious windstorm suddenly swells up, sending the partygoers scrambling for cover while Holden nervously looks around in disbelief. 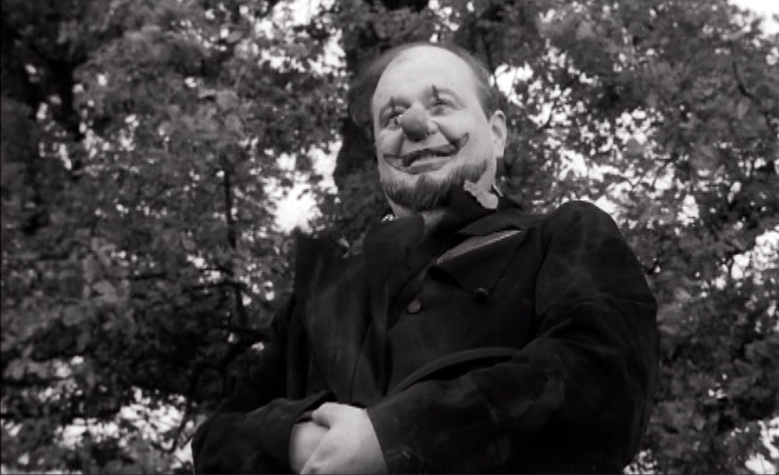 The shot of the self-satisfied Karswell in clown-face grinning while elemental chaos swirls around him is a high point of the film. 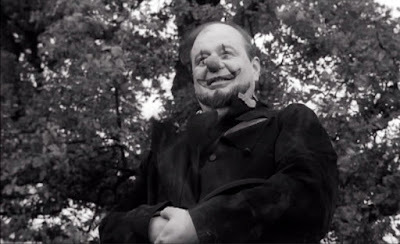 Karswell takes the creepy clown act to the next demonic level. MacGinnis was an extremely versatile character actor who started out doing Shakespeare at London’s Old Vic theater, then over the course of the next five decades appeared in over 75 films and TV shows. He appeared in almost every genre, from historical dramas to war films to spy thrillers to horror and science fiction. In addition to Night of the Demon, his horror/sci-fi credits include Jason and the Argonauts (1963; playing Zeus); Island of Terror (1966; with Peter Cushing), and the anthology horror film Torture Garden (1967). "But where does imagination end and reality begin? What is this twilight, this half world of the mind that you profess to know so much about? How can we differentiate between the powers of darkness and the powers of the mind?" Something to think about on a cold, dark night, when your imagination is most susceptible to playing tricks on you. 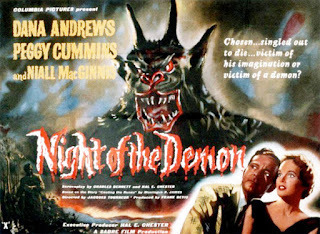 Where to find it: The Sony Pictures DVD includes both the original UK 95 minute Night of the Demon, and the 82 minute U.S. release, retitled Curse of the Demon.